Where Do Crabs Live in the Ocean? 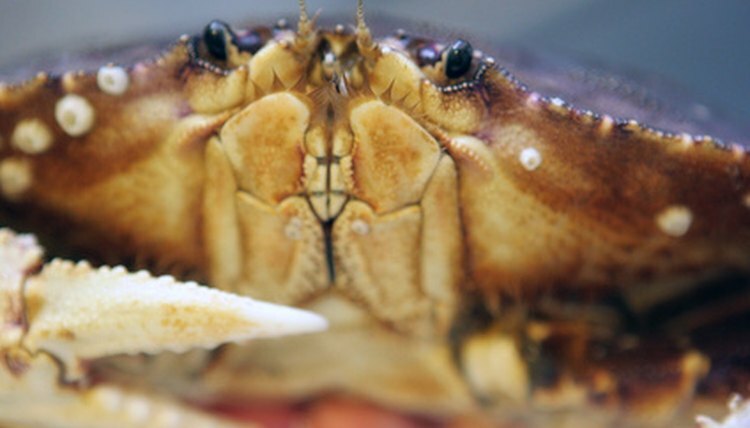 Crabs are related to shrimp and lobster, though crabs walk sideways, burrow and swim. Crabs can live along ocean shorelines and in either subtidal or intertidal zones. Crabs have rather complex nervous systems and can adapt well to a variety of environments. They have acute senses of smell, taste and sight and can be aggressive to obtain food or a mate. Crabs can live in estuaries or rocky shorelines. Some forms of crab live only in the subtidal zones, which means that they live in a habitat that is continuously submerged in an estuary system. Other crabs can live in the intertidal zone, which means that they live between the high-tide and low-tide marks. Crabs most often seek to burrow out of sight for protection. They most often hide under vegetation or rocks, in rock crevices and by burrowing into soft mud and sand.